Yes, Civil War II: Revenge/Return of the Civil is happening—but our early skepticism at Marvel simply reheating its major 2007 comic book event to tie into the next Captain America movie seems to have been mostly waylaid by new information that teases the conflict that pits hero against hero will be at least a little different. Over the weekend Marvel (via the New York Daily News) unveiled information for a recent writers summit that focused on hashing out the basic plot for Civil War II: Bigger, Badder, and More Civil. Instead of an allegory about civil liberties and personal freedom versus security as the original Civil War was, the sequel’s core argument will revolve around the debate of whether or not superheroes should use a mysterious new power to stop crimes before they ever happen. Said power will come from a new character who enters the Marvel universe with the power to calculate future events with uncanny accuracy, splitting the heroes of the world into two camps: One lead by Captain Marvel on the pro-Minority Report side of using this power to pre-punish and predict criminal activity, and the other “Carol, have you even seen Minority Report! ?” side arguing that you can’t do the time before you do the crime, lead by Iron Man. 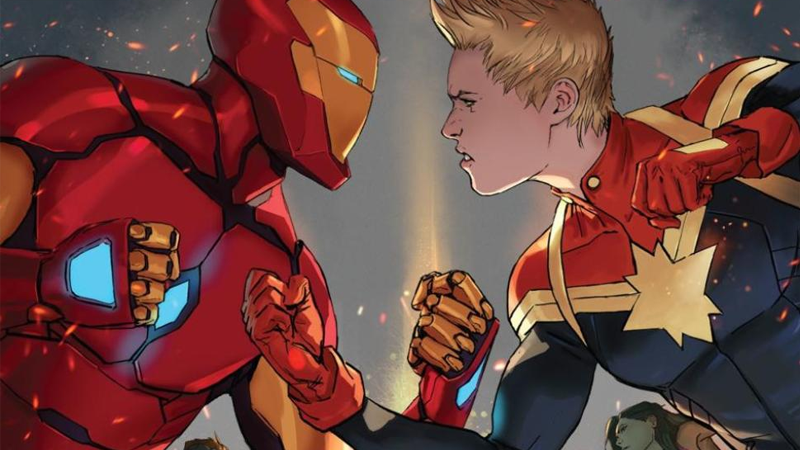 So far, so different, but where Civil War II: The Civil Awakens won’t really differentiate from its predecessor—or, like, any event comic book ever—is the fact that it will revolve around the death of a major Marvel hero, just as Civil War saw Captain America assassinated in its finale (he got better, of course, because comic boooooooks). This unidentified hero will be revealed by the new precognitive character to be responsible for a massive tragedy three days into the future, and must be killed to prevent it. The twist, the one doing the killing will be another big Hero, forced to kill for the greater good. In the New York Daily News article, Spider-Man was ruled out of being the one to perish (although he was the first floated, because Peter Parker cannot catch a break), as was the Human Torch, but ultimately, both the dead hero—the use of “him” in the New York Daily News article seems to imply that they’ll be male, but that might be an innocent slip of the tongue—and the killer will only be revealed when Civil War II: Dude, Where’s My Registration Act? hits shelves in the comic months. We thought we’d have some fun though, and turn the speculation over to you with not one, but two polls. Which major Marvel superhero will perish? And, considering this is comic books and death is about as permanent as an ice cream sundae on a sweltering summer’s day, just how long will they be dearly departed for? Image Credit: Civil War II #1 cover, via Marvel.